Jianmao Tower was fun! It was a bit cloudy though when we went there but there were a lot of things you can do once you reach the top. I ended up buying milk tea as I enjoy the view over Shanghai. The staff are friendly and polite and the transaction was fast with them just scanning the QR Code of the coupon. 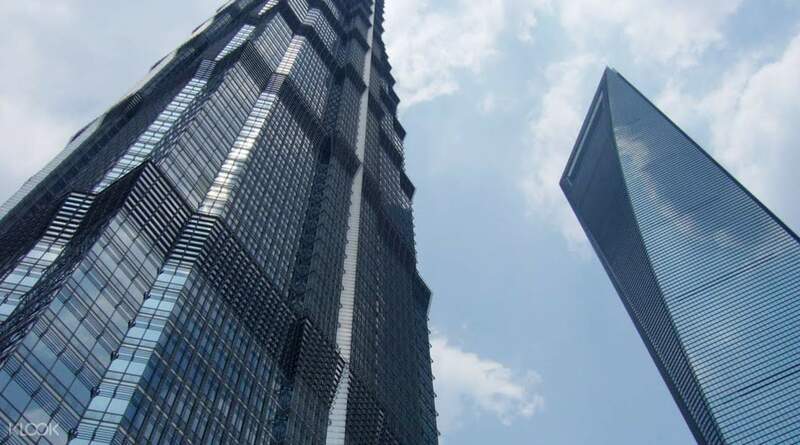 Take your Shanghai experience to different heights (literally) by climbing up to the 88th floor of the popular Jin Mao Tower. Standing at 420.5 meters tall, Jin Mao Tower is one of the tallest skyscrapers in Shanghai. It's viewing deck, at 340.1 meters covers an area of 1520 square meters - perfect to get a panoramic view of the city. 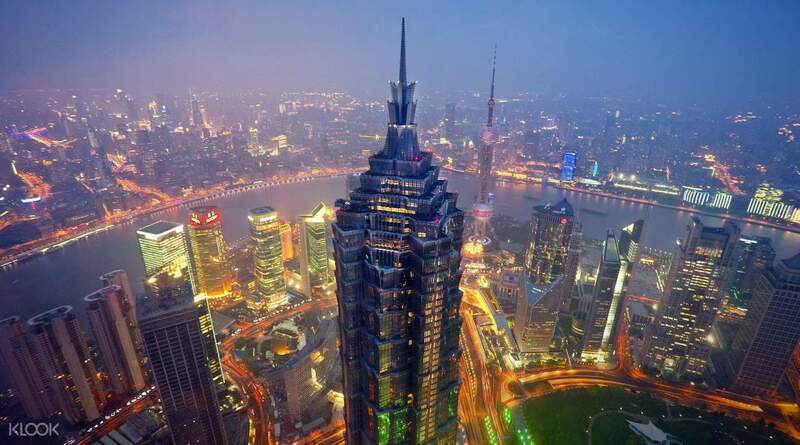 From the viewing deck, you can see across the river to the beautiful Bund Scenic Area, and get a glimpse of some of Shanghai's most famous landmarks from a completely different perspective. 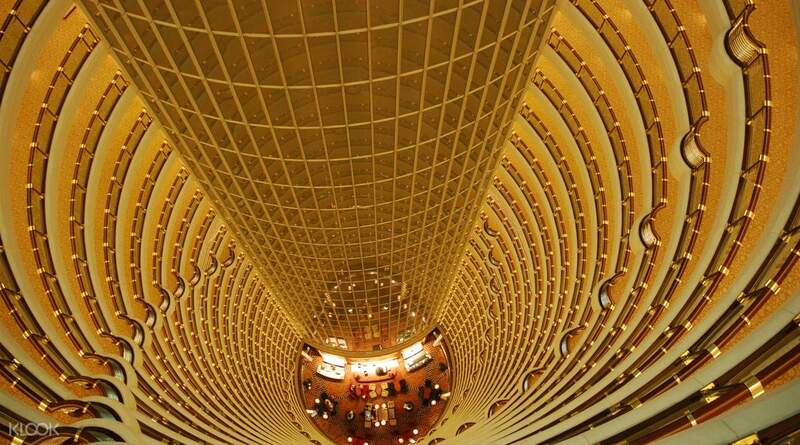 The tower is also home to Grand Hyatt Hotel, a 60 meter long glass skywalk (without rails!) and two of the fastest elevators available that can take you from the ground floor to the 88th in 45 seconds! All in all, a great way to up your experience of the beautiful city of Shanghai. Ride a high speed elevator that can take you from the 1st floor to the 88th in just 45 seconds! Jin Mao was very easy to find because of its avant-garde exterior. It is the only building in the vicinity with spikes and it looks fairly western. The ticket exchange with my Klook voucher was really convenient too! When you enter the main entrance, turn left and you will see a giant mural. Walk through it to enter the basement where you will see the Observatory Ticket Office. Present the Klook voucher and the staff will print out the tickets for you, simple! Join the queue to take the lift up and your journey begins :) There was even an option to walk onto the balcony on the 88th floor but nobody did it during my time up there. 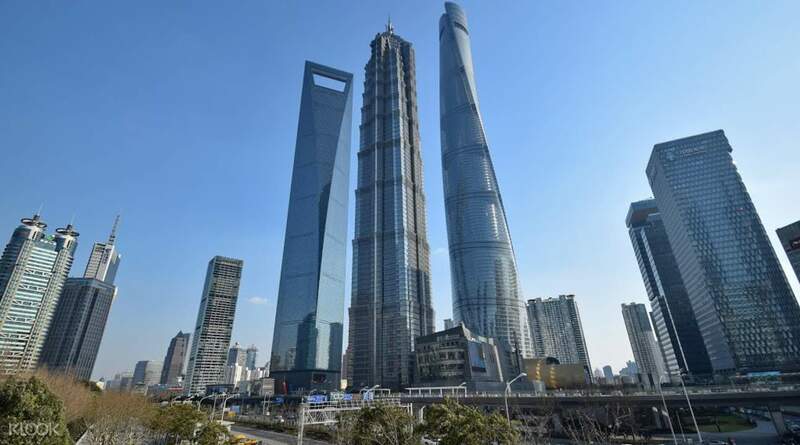 Jin Mao was very easy to find because of its avant-garde exterior. It is the only building in the vicinity with spikes and it looks fairly western. The ticket exchange with my Klook voucher was really convenient too! When you enter the main entrance, turn left and you will see a giant mural. Walk through it to enter the basement where you will see the Observatory Ticket Office. Present the Klook voucher and the staff will print out the tickets for you, simple! Join the queue to take the lift up and your journey begins :) There was even an option to walk onto the balcony on the 88th floor but nobody did it during my time up there. There are quite a few choices to have a spectacular view of the city, we chose this since it’s reasonably priced and the building looks fantastic (it looks like a pagoda). The whole experience was such a delight! Ticket claiming was quick. We went in the afternoon (2PM), the queue was reasonable. The wait time was 10 mins to ride the lift up to the viewing deck. The views are to die for! It’s spectacular in very angle. There was a warning of low visibility when we went but the sun was up and shining during our trip. Overall we spent an hour to enjoy the spectacular views. There are quite a few choices to have a spectacular view of the city, we chose this since it’s reasonably priced and the building looks fantastic (it looks like a pagoda). The whole experience was such a delight! Ticket claiming was quick. We went in the afternoon (2PM), the queue was reasonable. The wait time was 10 mins to ride the lift up to the viewing deck. The views are to die for! It’s spectacular in very angle. There was a warning of low visibility when we went but the sun was up and shining during our trip. Overall we spent an hour to enjoy the spectacular views. Jianmao Tower was fun! It was a bit cloudy though when we went there but there were a lot of things you can do once you reach the top. I ended up buying milk tea as I enjoy the view over Shanghai. The staff are friendly and polite and the transaction was fast with them just scanning the QR Code of the coupon. Jianmao Tower was fun! It was a bit cloudy though when we went there but there were a lot of things you can do once you reach the top. I ended up buying milk tea as I enjoy the view over Shanghai. The staff are friendly and polite and the transaction was fast with them just scanning the QR Code of the coupon. Despite the fact that it is lower than the next two, the view is wonderful. Despite the fact that it is lower than the next two, the view is wonderful. Nice view from the top of the tower. Klook sent me the ticket code and I did not have any problem in the entrance. No long waiting time to take the elevator on the way up and down. Nice view from the top of the tower. Klook sent me the ticket code and I did not have any problem in the entrance. No long waiting time to take the elevator on the way up and down. Fascinating view of Shanghai city. There is even a skywalk where you are able to walk outside of the building! Fascinating view of Shanghai city. There is even a skywalk where you are able to walk outside of the building! No long lines, the elevator going up is superb. I didnt even know we were going up. We were at the 88th fl in just seconds! The view is amazing! No long lines, the elevator going up is superb. I didnt even know we were going up. We were at the 88th fl in just seconds! The view is amazing! Not the best view considering it's not as high as the other towers. Also dependent on whether there is a lot of pollution on the day. Otherwise, the top view of the hotel lobby was good. Not the best view considering it's not as high as the other towers. Also dependent on whether there is a lot of pollution on the day. Otherwise, the top view of the hotel lobby was good. VERY EASY TO USE. MADE MY TOUR MORE CONVENIENT AND I REALLY ENJOYED EVERY MOMENT. VERY EASY TO USE. MADE MY TOUR MORE CONVENIENT AND I REALLY ENJOYED EVERY MOMENT.